8 December 2010, at 5:20a.m. VIET NAM - The recently held Vietstock Expo & Conference which took place in Ho Chi Minh City proved a big success for Big Dutchman: for three days, the company’s representatives welcomed a steady flow of visitors to their booth at Viet Nam’s number one feed and livestock trade show. 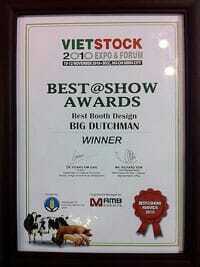 Thanks to the successful planning and organising, which was made possible by the team efforts from its Viet Nam, Thailand and Malaysia offices, Big Dutchman’s custom-built stand design won the ‘Best Booth Design’ at the VIESTOCK Expo & Conference. With a booth size of 72 square metres, Big Dutchman showcased a variety of its poultry and pig equipment, such as cage equipment, nest systems, feeding and drinking systems for egg and meat production; as well as housing equipment and feeding systems for modern pig management. Also featured at the show were Big Dutchman’s climate and control systems for poultry and pig management. Throughout the show, key individuals from both the poultry and pig sectors visited the Big Dutchman booth and showed great interest in its product range.